Snippets of Jack: "Do You Care To Interpret?" "Do You Care To Interpret?" Jack, Barbossa, Will, Elizabeth, Gibbs, and the crew almost die of thirst and heat as they try to figure out away to return to the land of the living. As usual, it's Jack who saves the day and gets them safely back, (and into the hands of Sao Feng, but that's besides the point). It's ironic that the crew is so intensely hot as they leave yet freezing cold as they travel to Davy Jones Locker to save Jack. Not expecting to travel through such a cold area, the crew does not have the right kind of provisions to survive the cold. Their boat is quite open at the top, and they've barely got any clothes. One of Sao Feng's men even breaks his frozen toe off! Of course, Elizabeth sits all wrapped up in a fur blanket as the rest of the crew shivers to death. The more miserable they get, the more they wonder whether saving their beloved captain is worth all this pain. Pintel: "No one said anything about cold." Ragetti: "I'm sure there must be a good reason for our suffering." Ragetti is now very concerned for being holy ever since he had a chance at dying. What better reason than that you are going to save the best captain ever? Pintel, however, remains quite a pessimist. Pintel: "Why don't that obeah woman bring Jack back the same way she brought back Barbossa?" Tia Delma does not appreciate this kind of talk about her. Tia Delma: "Because Barbossa was only dead. 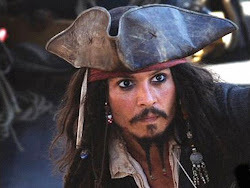 Jack Sparrow is taken, body and soul, to a place not of death, but punishment. The worst fate a person can bring upon himself stretching on forever. That's what awaits at Davy Jones' Locker." Poor Jack! Ragetti sees my point about needing to rescue Jack. Ragetti: "Yeah. I knew there was a good reason." Meanwhile, Will is having trouble using the maps to navigate them to the Locker. It probably doesn't help his mood that his clothes and hair is frozen. Will: "Nothing here is set. These can't be as accurate as modern charts." Tai Hung: "No. But it leads to more places." The glass is always half full. Inspired by Tai Hung's optimism, Will continues to study the charts, turning them in every direction. Will reads the charts alound: "Over the edge. Over again. Sunrise sets. Flash of green." After constantly rereading the strange messages of the charts, Will takes them to Barbossa. Will: "Do you care to interpret, Captain Barbossa?" For some reason there is quite the edge in his voice. As if Barbossa purposely made the charts difficult for Will to understand. Barbossa: "Ever gazed upon the green flash, Master Gibbs?" Gibbs: "I reckon I seen my fair share. Happens on rare occasion. The last glimpse of sunset, a green flash shoots up into the sky. Some go their whole lives without ever seeing it. Some claim to have seen it who ain't. And some say . . ." Pintel: "It signals when a soul comes back to this world from the dead!" Sound familiar? Barbossa: "Trust me, young Master Turner. It's not getting to the land of the dead that's the problem. It's getting back." Well doesn't that sound reassuring?